due to limited resource it will not be a full-blown global event with participation from all global resources. So, similar to the counter-meeting to the 2011 GFMD in Geneva/Switzerland (another country where the cost of living is not exactly cheap…) many of the participants will be Europe-based, although the list of guests includes activists from outside Europe such as Eni Lestari, chairperson of the International Migrants’ Alliance (IMA) from Hong Kong. A strong emphasis of the program will be on the situation of asylum seekers in Europe, with situation reports from many countries. The German movement “Caravan – for the rights of refugees and migrants” will be present as well and report from the Refugee Tribunal in Germany, which I have regrettably missed. 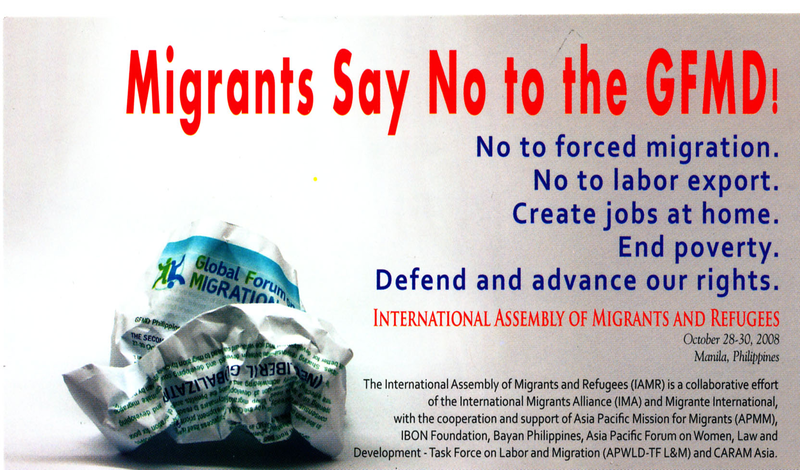 In line with the “mission statement” of this blog to cover “all things GFMD” I will try to attend at least some of the meetings with their proclaimed goal to serve as a “venue to expose the promotion of the commodification of migrants and modern-day slavery that the GFMD creates”. The program paper for the meeting also draws explicit links to the last two global events I observed – the United Nations High-Level Dialogue on Migration and Development in New York in September 2103 and the 9th WTO ministerial conference in Bali in December 2013. While the first link is fairly obvious, I believe that the second one does indeed merit more attention. There are also plans for a speak-out and protest action in front of or nearby the GFMD government meeting on May 15, so that is an event I very much will try to cover. This entry was posted in Gfmd, GFMD Government Meeting, GFMD in General, IAMR, UN HLD, WTO and tagged Asia, civil society, development, domestic work, gender, Geneva, Germany, gfmd, global governance, human rights, iamr, International Catholic Migration Commission, Migrant worker, migration, NGO, Non-governmental organization, pga, Philippines, Switzerland, United Nations, WTO. Bookmark the permalink.